Coming into a New Year always makes us review the year before and plan for the year ahead. 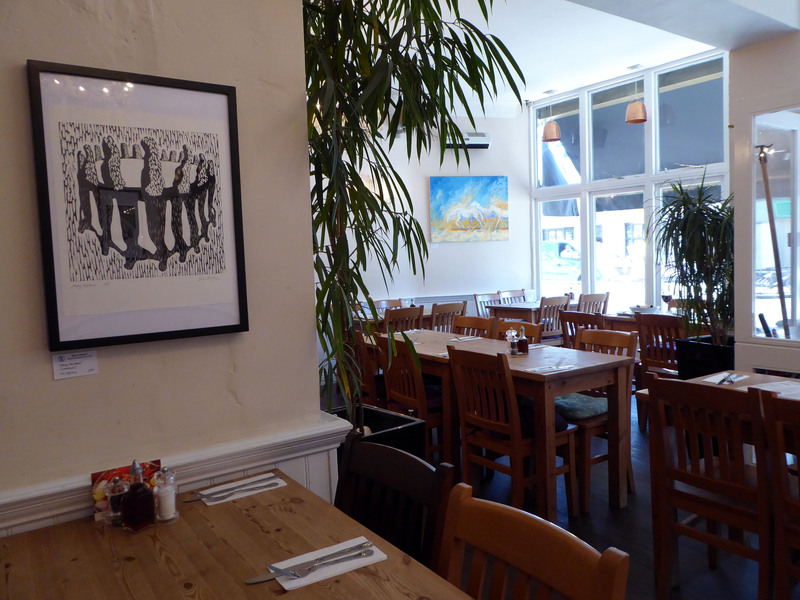 Viv has revisited the large mixed media prints she had started based on her paintings and drawings from Greece. 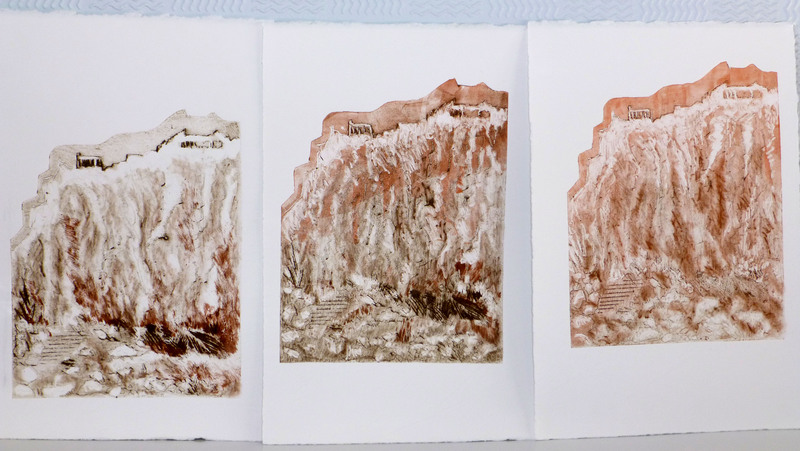 The first group, of the Acropolis in Athens, are finished now. 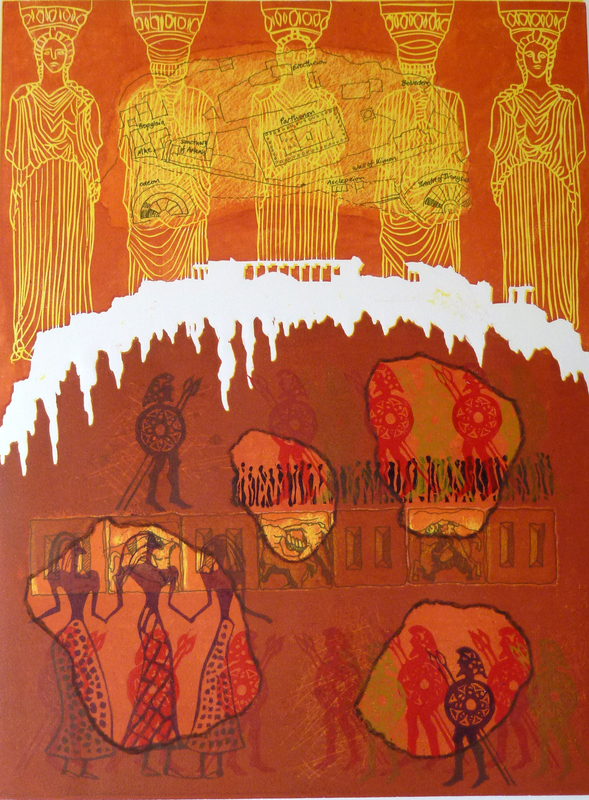 Viv says: I loved how the silhouette of the Acropolis seemed to float above the city, out of time and space. 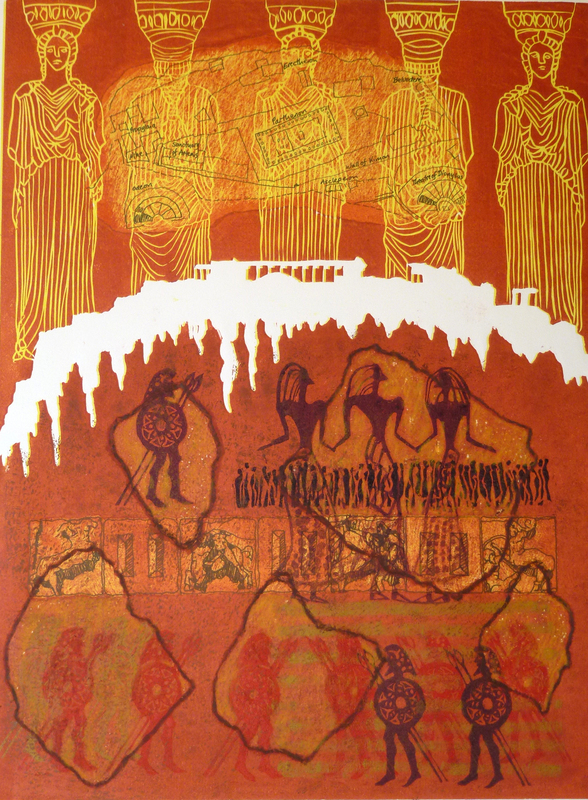 Impossible not to think of the ancient Greeks and their gods, their stories and legends, the images of their wars and feasts – so I’ve tried to include some of these ideas in the series of prints. 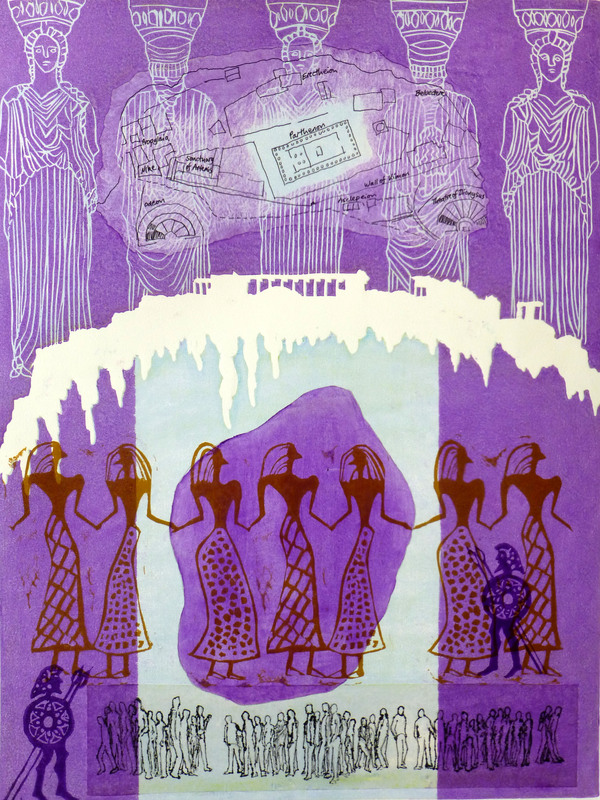 The main image of the Acropolis and the caryatids (the figures from the Erectheum) are carved into a woodblock, which forms the structural basis for this group of prints. 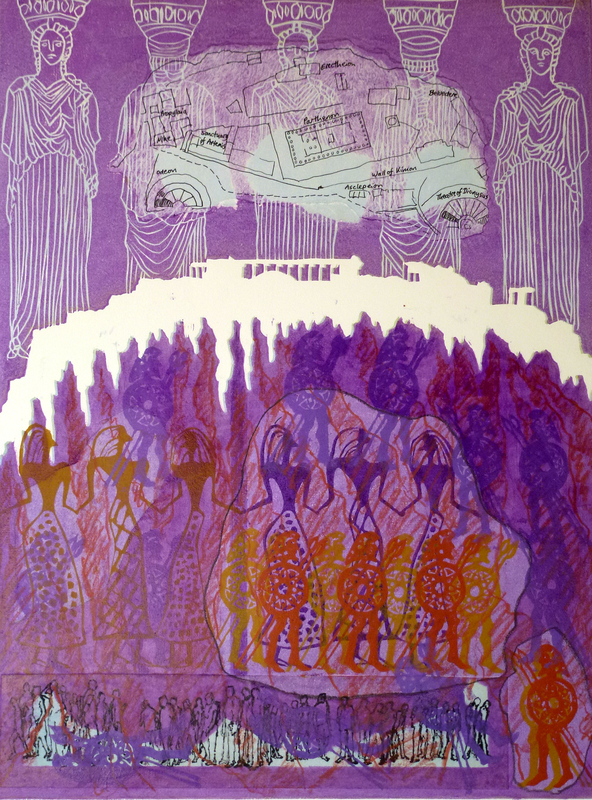 I drew a map of the Acropolis site and it is collaged in, under a layer of printed ink, with the caryatids. The dancing figures and the warriors are small relief prints made from drawings of pot fragments, so the idea of fragment shapes is also used. 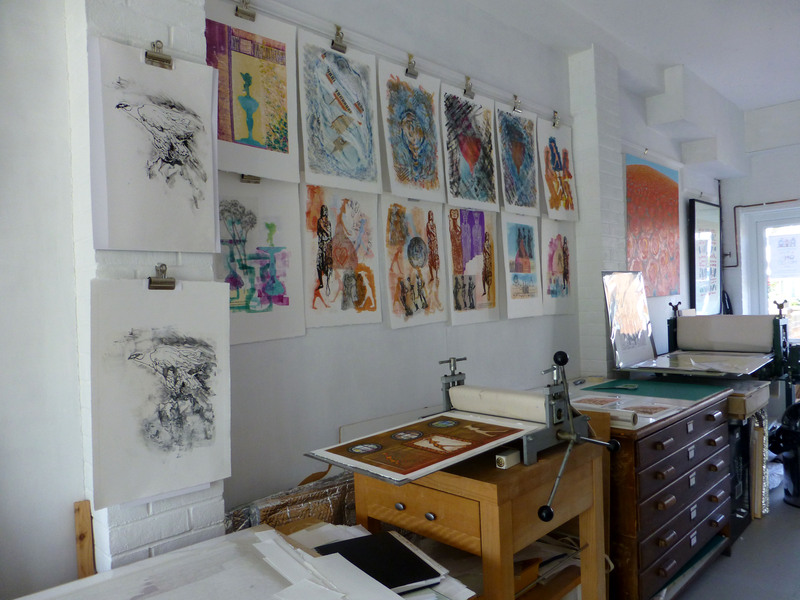 Each of these monotypes makes use of the main woodcut, some embedded collage (chine colle), relief prints and sometimes direct drawing in oil pastel. 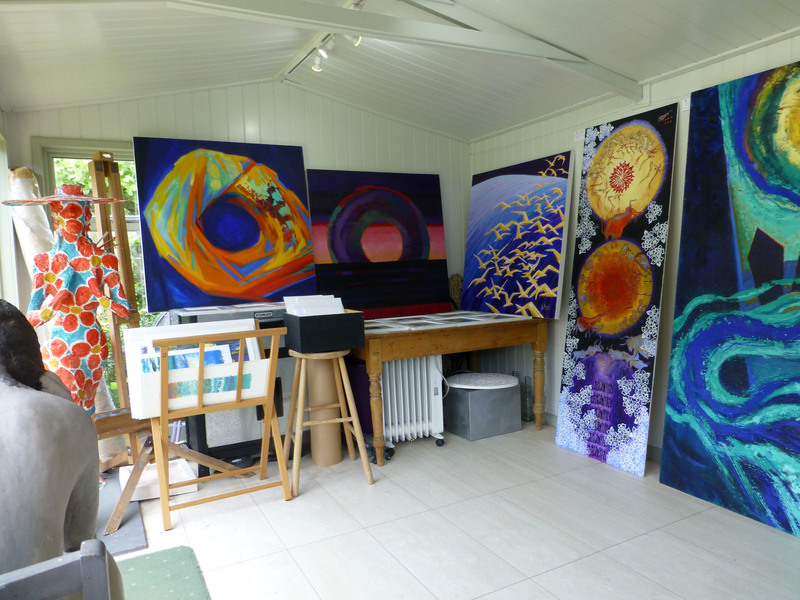 You may have seen the first one or two in their early stages last year in our Open Studios in June. 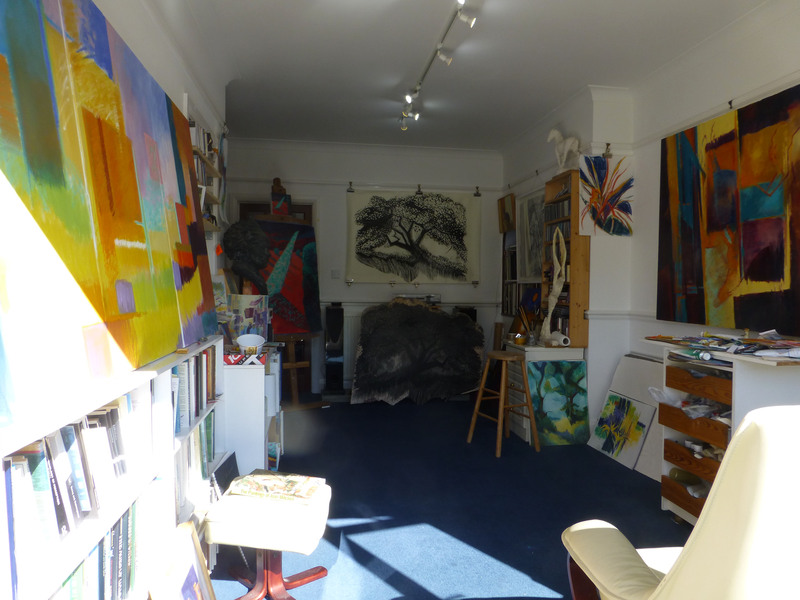 This year our Open Studios will be in the last two weekends of June and the first one of July as part of Worthing Artists Open Houses. 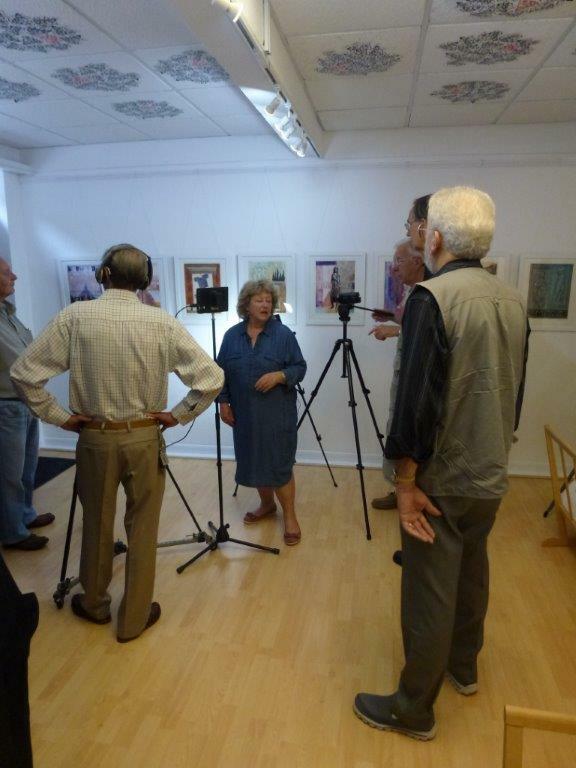 While the government is in chaos and we wonder whether our European friends will still talk to us, we peacefully continue with the Worthing Artists Open Houses (www.worthingartistsopenhouses.com). 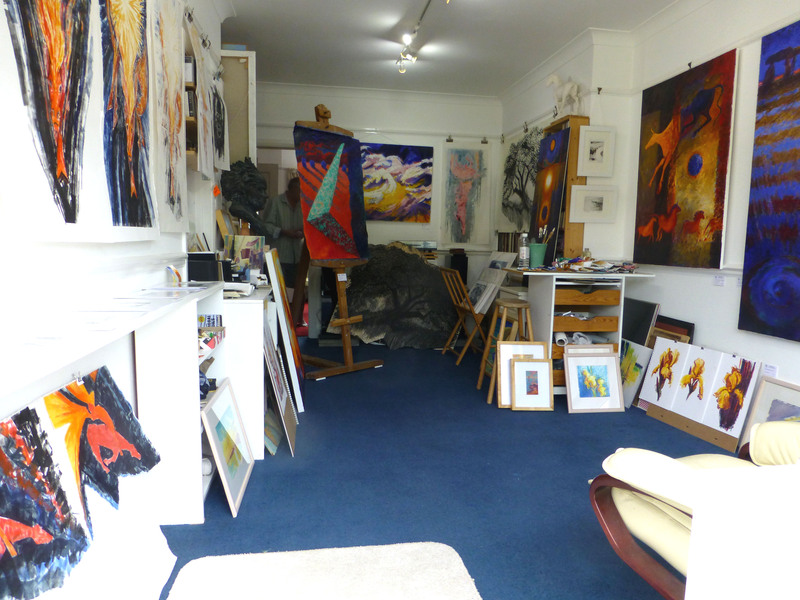 Viv and Paul’s studios are open for one more weekend – check our website www.martinstudios.co.uk – and we also have a small exhibition in the Fish Factory, on Brighton Road, Worthing. 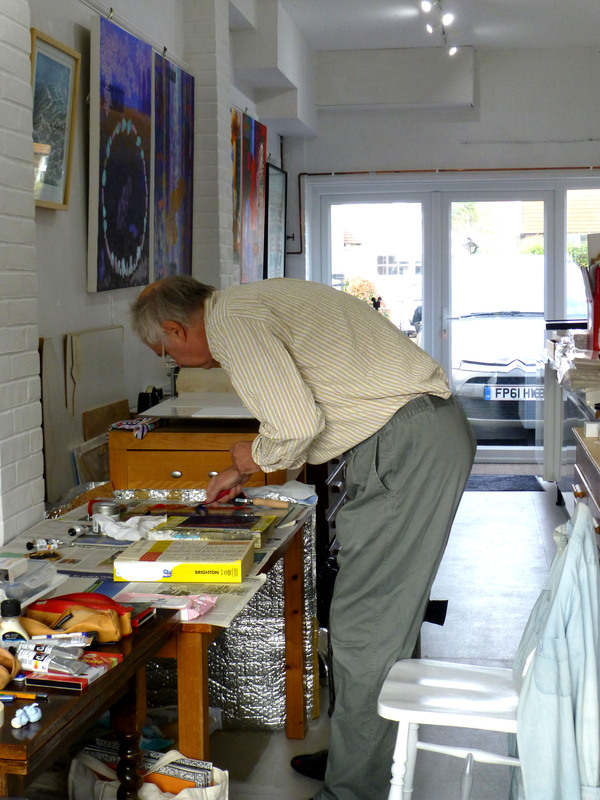 Martin Studios are open at 7, Hythe Road, Worthing, BN11 5DA. 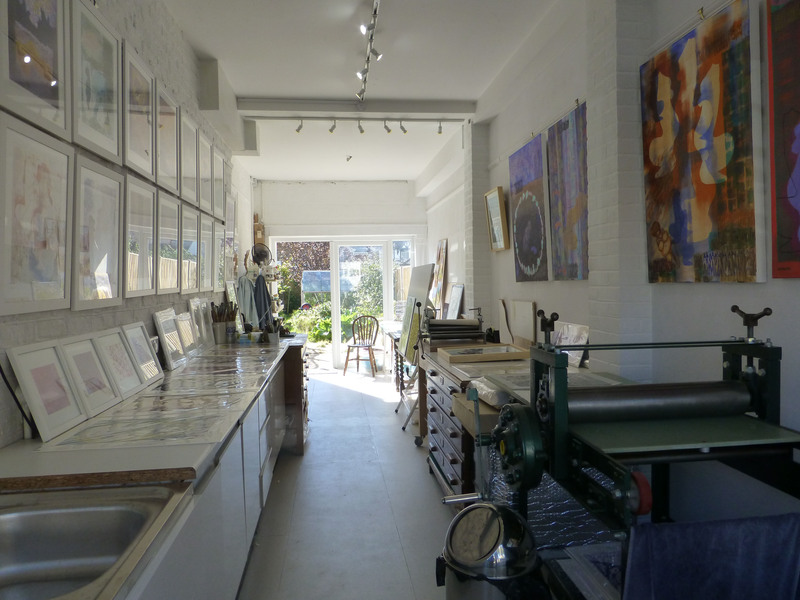 Our show includes some of the work we made after revisiting Greece and some very recent monotypes made in Florence. We are open on Saturday and Sunday, July 2/3 from 11am – 5pm. 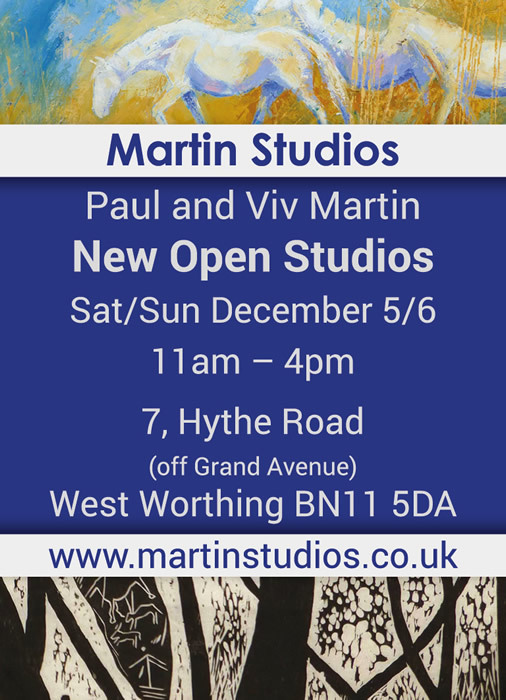 Viv and Paul Martin are opening their studios for the Worthing Artists Open Houses 2016 at 7, Hythe Road, Worthing, BN11 5DA. Our show will include some of the work we made after revisiting Greece and some very recent monotypes made in Florence. We will be open on Saturdays and Sundays, June 18/19, June 25/26th and July 2/3 from 11am – 5pm. It was hard to get going again in January! 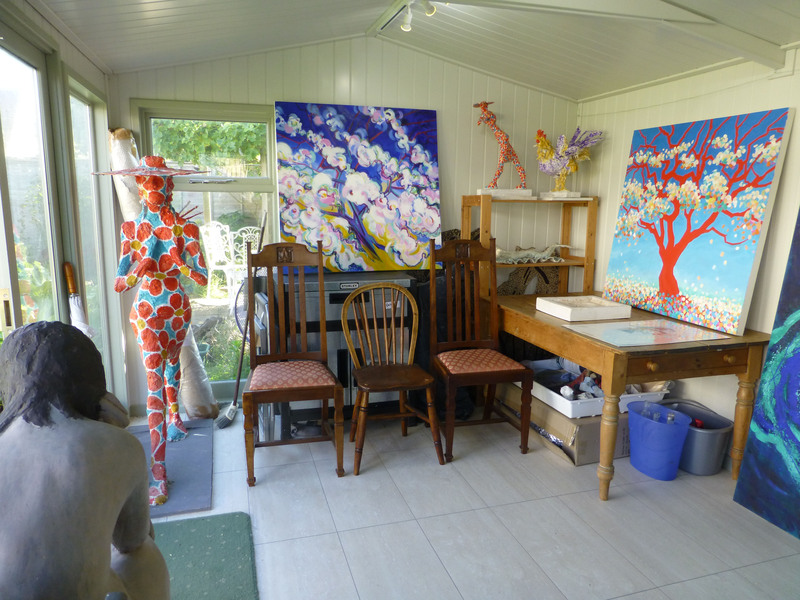 It’s difficult to feel very creative when it’s cold and dark, so the bright days really help! 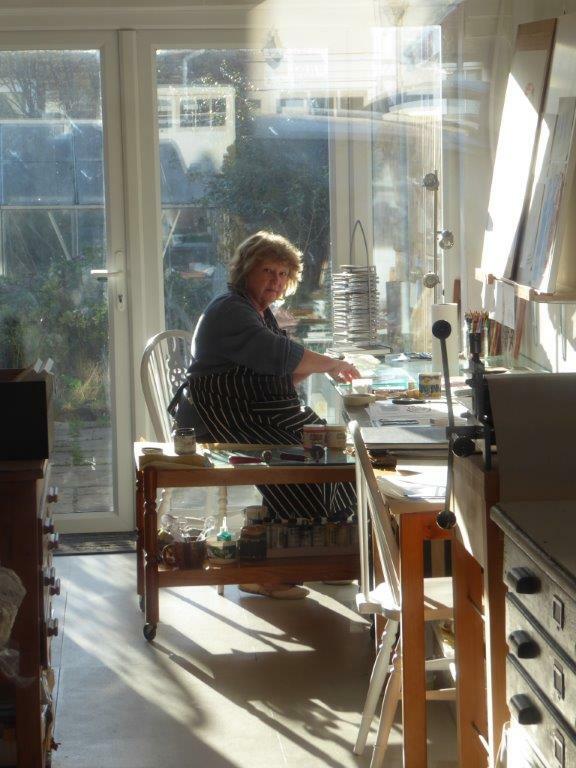 Viv’s studio is lovely when the sun shines and here she is working on a series of small drypoints in the PETG plastic sheet she uses for monotypes. This time she shaped the plate as well as incising the drawing and then printed it as a monotype in several different ways. Paul’s also been doing some printing – here he is experimenting with a small woodcut, trying it in colour instead of the former black and white. 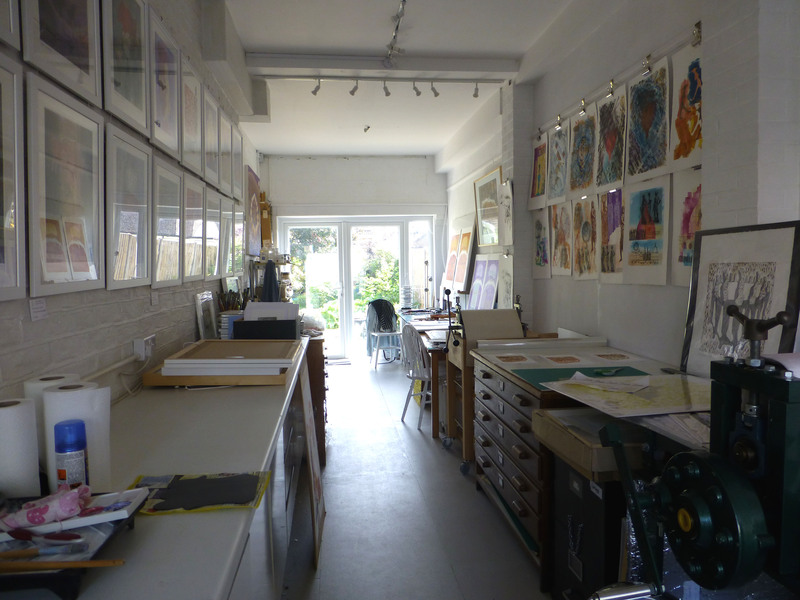 We’re having an Open Studios weekend on Dec 5th/6th from 11am – 4pm in our new studios in West Worthing, at 7, Hythe Road, Worthing, BN11 5DA (just off Grand Avenue). 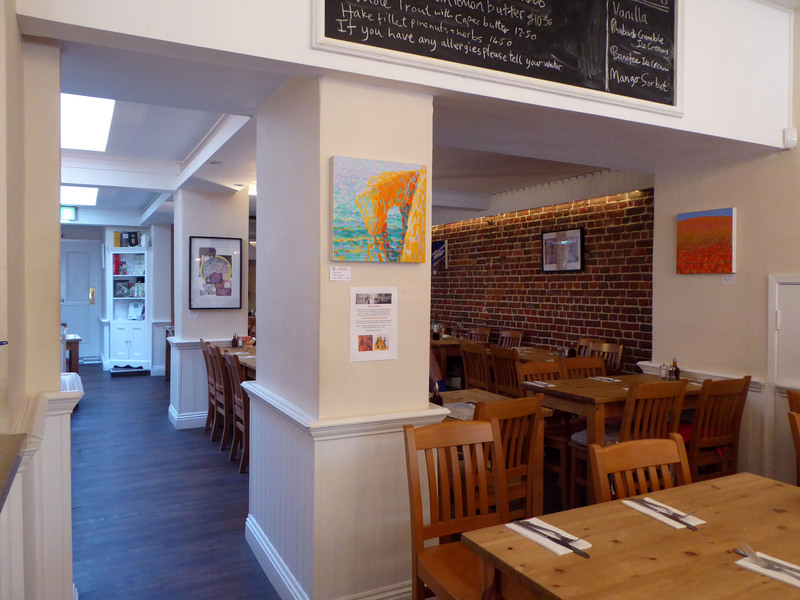 Come and have a look at our work and share a glass of wine and a mince pie! 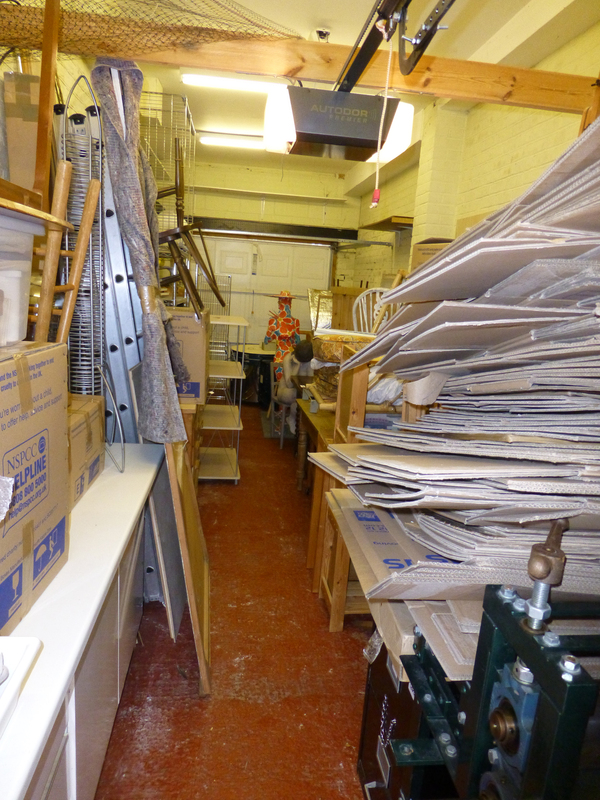 This is how our studios looked when we’d just finished them and moved our work from the shop back into our studios. This time we’ll be showing a mixture of new work and older work, maybe with some of our work in progress (depending on how it progresses!). 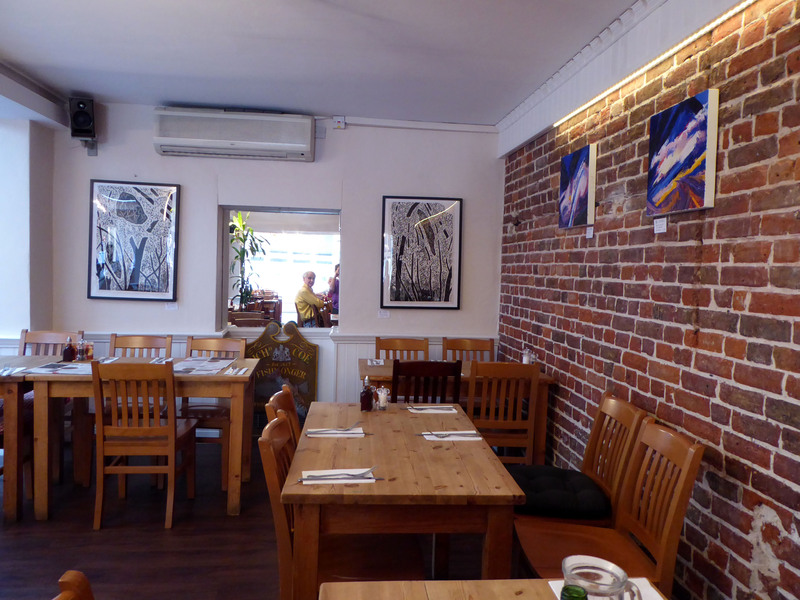 We’re showing as part of a Christmas art trail and you can pick up a map and information about where you can visit other local artists. 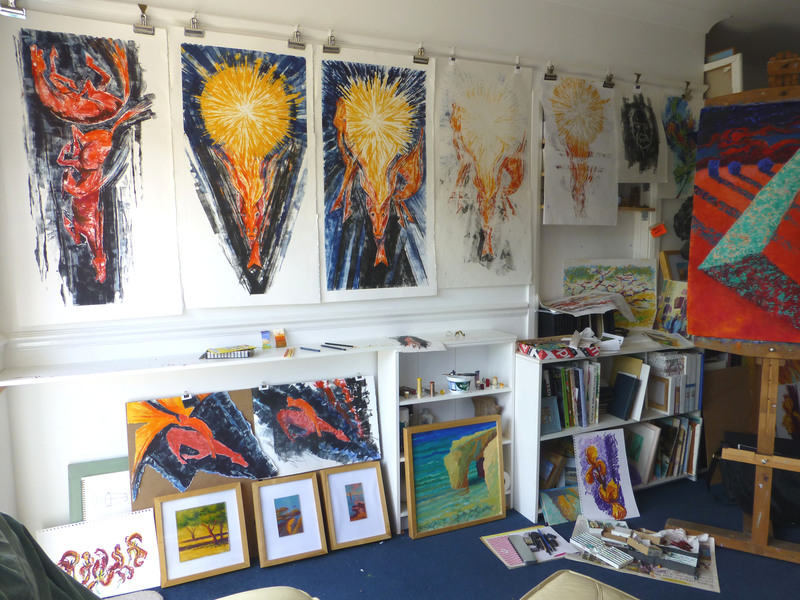 Interesting times in our studio/gallery! 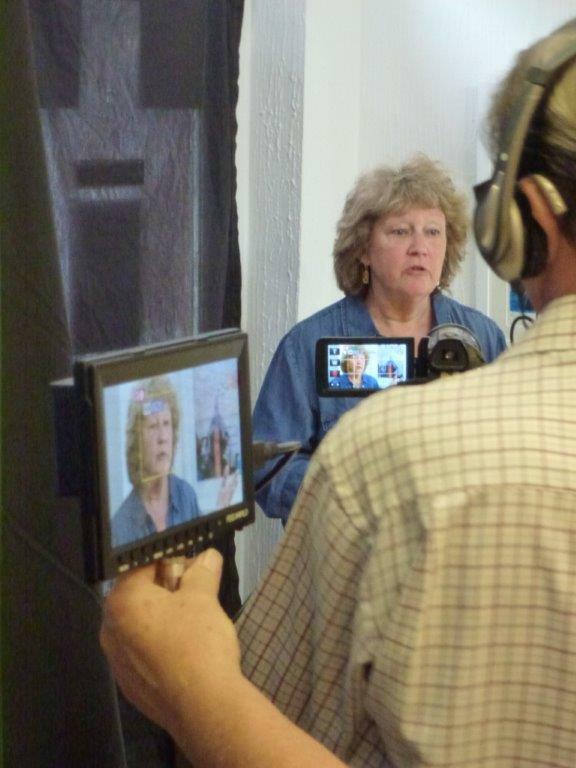 We’d always intended to use the space to try out some different projects and through August we’ve been making videos with members of the South Downs Film Makers. Our plan was for Paul and Viv to each make a short video in which we talk about some work as though we’re showing it to studio visitors. 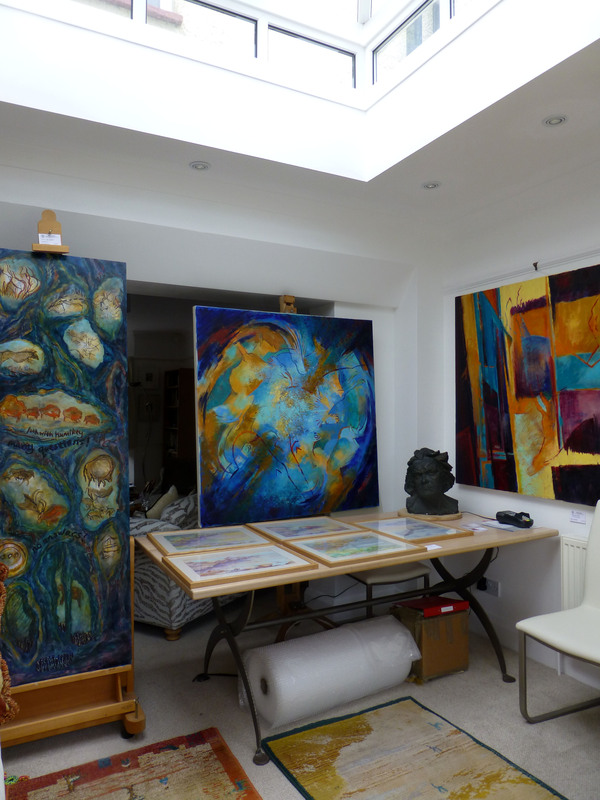 Viv talks about some of her mixed media work about making art in Florence and Paul talks about how prehistoric art has inspired some of his recent large oil paintings. We each made a draft script and discussed it with the Club team, working out how to hang the work and what sort of lighting would be best. We only had a rough idea of timing, because neither of us is good at remembering to keep to a script and we wanted to try to be as natural as possible. 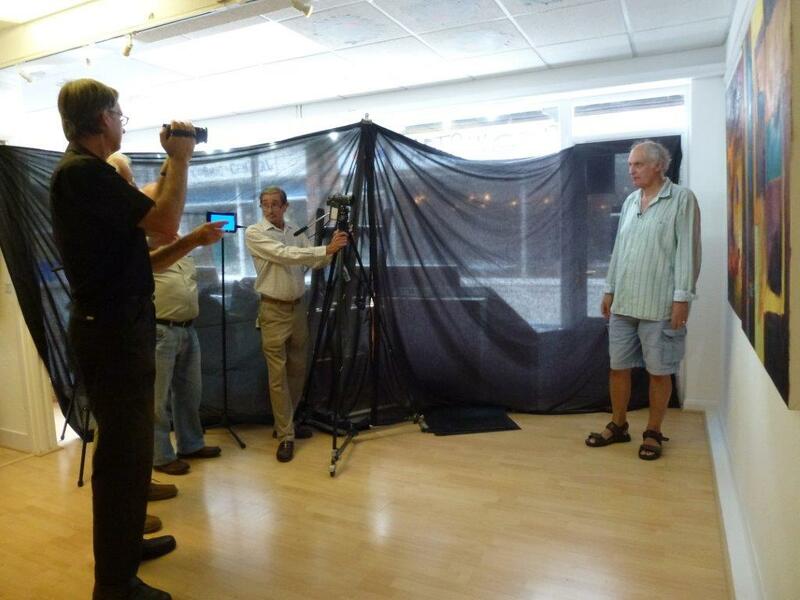 Filming went really smoothly, except for the times each of us went blank and needed a few more takes! 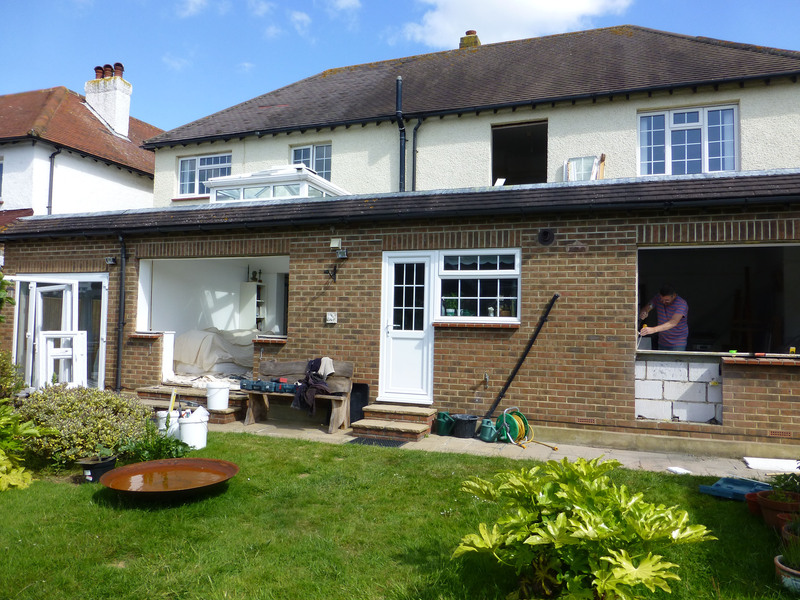 Then we found we couldn’t move around with enough space for the cameras, so we had to do some speedy re-hanging. 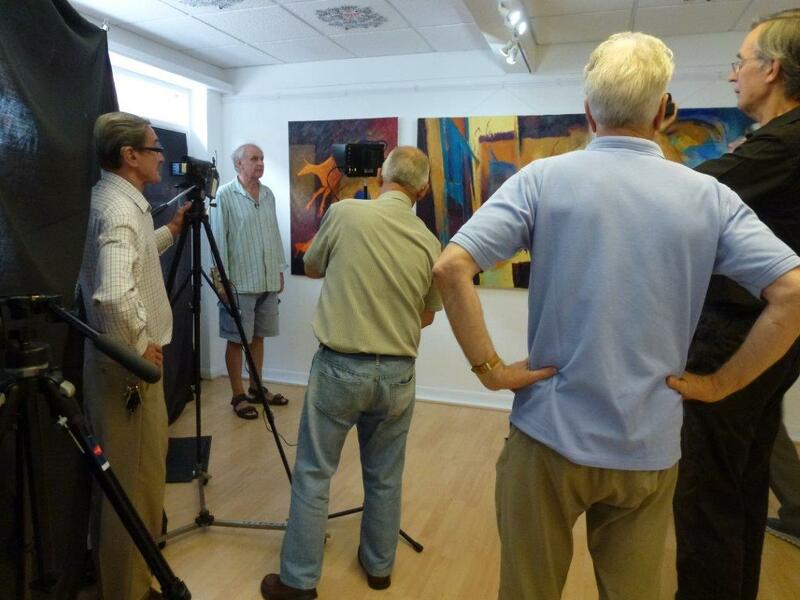 The Club team did a great job of both setting the scene and filming – they definitely earnt their coffee and iced buns! Some very skilled editing has almost been completed and we’ll soon be able to publish the videos. 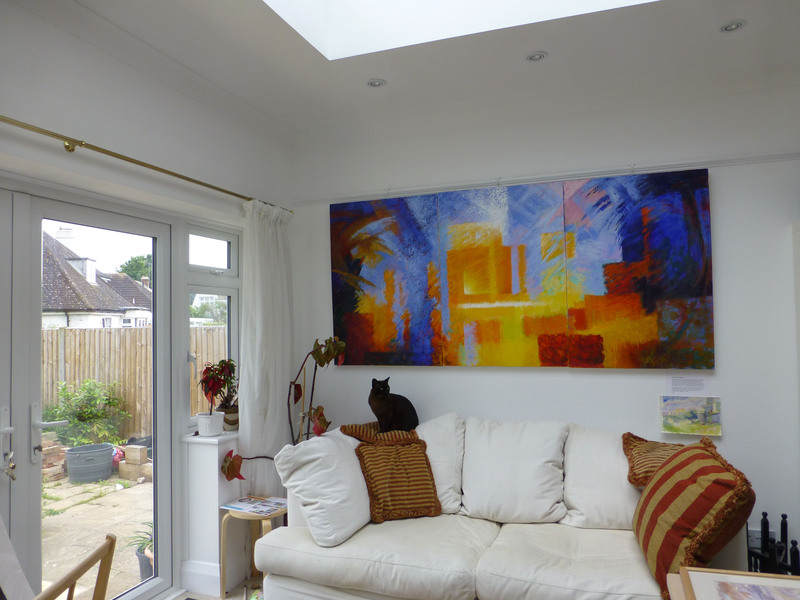 You might like to make a note that our next show will be in Brighton – the Brighton Art Fair on Friday and Saturday September 25th and 26th from 11am – 6pm and Sunday 27th from 11am – 5pm (www.brightonartfair.co.uk).